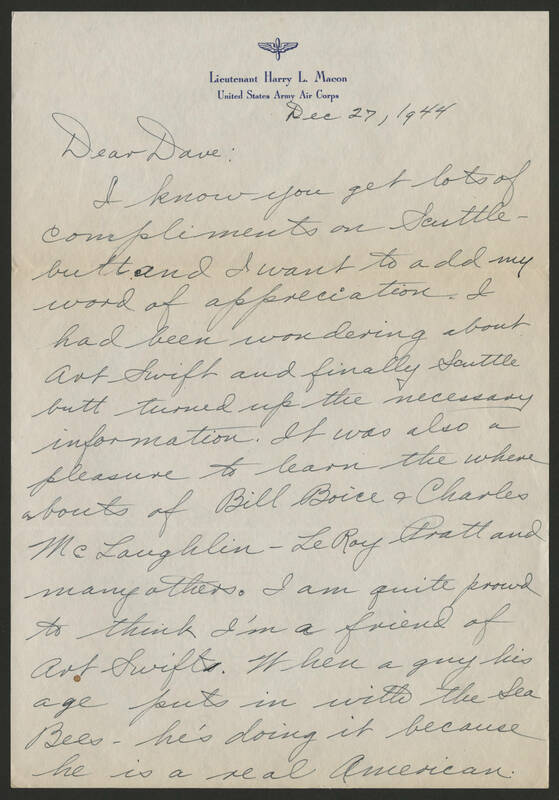 Lieutenant Harry L. Macon United States Army Air Corps Dec 27, 1944 Dear Dave: I know you get a lot of compliments on Scuttlebutt and I want to add my word of appreciation. I had been wondering about Art Swift and finally Scuttlebutt turned up the necessary information. It was also a pleasure to learn the where abouts of Bill Boice and Charles McLaughlin- LeRoy Pratt and many others. I am quite proud to think I'm a friend of Art Swifts. When a guy his age puts in with the Sea Bees - he's doing it because he is a real American.